One thing I love about Ryleigh's school is the projects she gets to do. She always gets so excited about them. 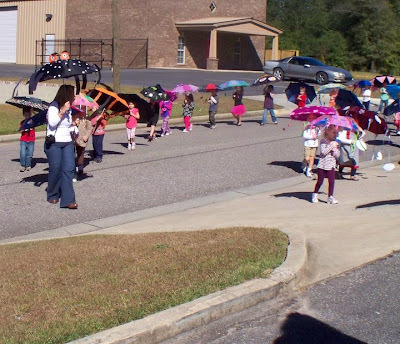 this past week she had to decorate an umbrella for an umbrella parade at school. They were going over the letter "U." I let her completely decorate it by herself. It was her idea and everything! I think she did an excellent job. The finished product. I had a meeting yesterday with Ryleigh's teacher to just discuss her progress to far with K4 and how she was doing. I was excited to talk to her and find out what Ryleigh is like at school. Mrs. Carter said she is an absolute delight! She said that Ryleigh is always so sweet to everyone and is everyone's favorite! The whole week we were in Disney the kids would want to say a special prayer for Ryleigh everyday! Mrs. Carter also said that she loves Ryleigh's fashion sense! It's no secret that my girl is a fashionista! 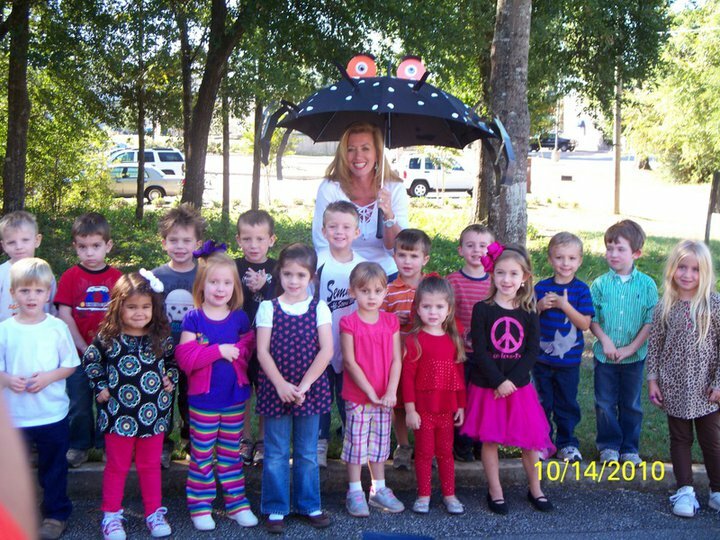 I mean look at how she dressed for the umbrella parade. She told me it was a special parade and she needed to be dressed up for it! Yesterday she wore a long maxi dress with cowboy boots, a cardigan and an huge flower headband. They can't wear cowboy boots to school and when I told Ryleigh that she said, "Mom, boys wear cowboy boots these are not cowboy boots, they are fashion boots! I think Mrs. Carter will think I look cute!" And she was right, Mrs. Carter loved them! Mrs. Carter also told me how she had to move Ryleigh to the front row close to her desk because Ryleigh likes Mrs. Carters attention all day long! Everything she told me just made me so happy! I mean who wouldn't want someone telling them for a solid 30 minutes how wonderful their kid was! :) She also said that she could tell that Ryan and I were doing a wonderful job raising her. That we give her the perfect mix of discipline and freedom. We enforce the things that matter without hindering her individuality. She is who she is and we love her because of it! We also talked about her progress as far as her school work. Mrs. Carter said that Ryleigh is so smart and on some levels is doing 1st grade work! One of Ryleigh's problems at school is she gets finished with her work early and wants to turn around in her seat and talk and make funny faces at the class. She does occasionally get in timeout for this. Mrs. Carter said she doesn't think Ryleigh is being openly defiant she just gets done early and gets bored. 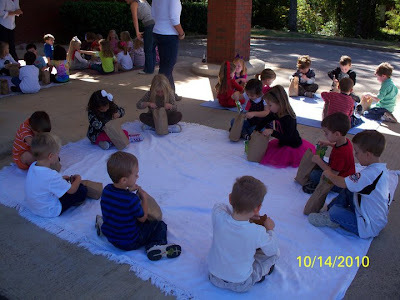 They are going to test next week and we will have a more accurate gage of what level Ryleigh is in school. I am so glad she is doing so well!! Thank you Mrs. Carter for loving and teaching our wild, sweet, smart little girl!! We love the school they go to and couldn't imagine a better place for our 2 kids. Thank you ABC for not only teaching our kids but helping us enforce Godly values and morals at such a young age! I love the umbrella! Such a cute idea!